“Hey can I request an interview of someone?” Chris asked. He then went on to tell me about the creator of the world greatest movie trivia game. He was extra interested in learning how to run a kickstarter campaign of a game that has already been printed. You can find Chris’ questions (10-12) at the end of the interview. Now let’s meet today’s guest and learn about his game. You can like his Facebook page here. Or follow him on Twitter here. See Justin explain the game here. Watch a family play the game here. Or watch an interview of Justin about his world greatest movie trivia game. Now on to our interview with Justin! 1. How hard was it to find playtesters for Movie Buff back when you first made it in 2014? In truth, I have been working on this game since 2000, with my first working prototype in 2005. It wasn’t too hard to find playtesters because of what I did for a living back then. I taught and directed improv in Washington Improv Theater in Washington DC. Once I had my prototype I had it on me at all times. And after classes or shows, we would go to the local bar and talk about improv, movies, etc. And then I would ask them to play and I’d break out the copy. I think one of the tougher things with having playtesters is you start to get nervous about your idea. Luckily though, between 2005 and 2011, I received a lot of great feedback from my students and friends that went into the redesign when I got the chance to make Movie Buff my full time (non paying) job. 2. What kind of feedback from playtesters helps you the most as a game designer? The first thing that I like to take away from a playtest is my observation of how much/little they seem to be enjoying the gameplay; that is, if I’m present for the game. You can get a pretty immediate feel for what areas need to be addressed by how well the game is flowing. Most people are honest about areas that need tweaking, but family/friends are less likely to be fully forthcoming about possible hiccups, in fear of offending the designer. Facial expressions, body language, and flow of the game speaks volumes. I would say be present for those tests as much as physically possible, because you’re missing out on a lot of helpful criticism by not seeing these cues, first hand. 3. You had your first print run in 2014 after a successful Kickstarter. How many copies did you have printed for this? We grassrooted the entire venture, from graphic designers to the actual print house. This means we relied heavily on word of mouth and friends of friends to get everything we needed. I had no useful knowledge about game making at the time of our Kickstarter, so we relied heavily on the kindness of strangers. For example, I posted a “Help me, I have no idea what I’m doing” on Facebook. And people came out of the woodwork to help me get to the right people to get the game made. After our campaign was successful, we were able to get 1000 copies of the first version made through a small print house in York, PA (U.S.). 4. How much money have you made (or lost) from your first print run? Basically, tell your 3 years younger self what he should have expected. Expect that the first two years will be blood, sweat, and tears with little or nothing to show for it, financially. Your first print run will be about making contacts, which will prove invaluable to your business. These are the foundations for the greater future of your game. Do not discount the importance of being present for the crucial conventions and do not minimize a show because it’s not considered “huge”. Some of our very best relationships in this business started when we had the availability to truly connect with people at smaller conventions. There, you will formulate a connection with committed customers, both individual and retail. Once they get your passion, you’ll be amazed with the reaches of their networks. Every venture is individual, and what we did may not be the path someone else would choose. I’m sure that there are those able to produce a product for far less, and more power to them. Our vision was to create something ready for market, so that retailers would not have to imagine what the finished product would be. Our goal was to create a brand. That takes a fair deal of capital. We have over 125K into the game. All of that was divided amongst production, graphics, legal, trademarks, copyrights, conventions, travel, marketing. Expect that you won’t see a return on investment until at least your second print run. But you’ll see it if you just keep your head down and work. Put your efforts toward public recognition. Keep your passion palpable and it will become infectious. Do your homework on what your costs will be. A lot of money was wasted by trial and error. 5. What are some things (2-5) you wish you had done differently with your first Kickstarter campaign? Like I said, I came up teaching, directing, and performing improv, so I am used to flying by the seat of my pants and making it up as I go along. I would have done more research to find a game manufacturing company, versus using a small printhouse that would give making a game a try. Simply because it would have been about 5 times less expensive to get the first printing done. The company did an amazing job with our first printing of the game, it was just not economically viable. The margins were horrible. I would have taken the time to get a film crew to professionally make the video we used. Simply, we shot the video using my ipad, in what is now my son’s nursery. There was little wow factor to the video, because it was more of a ‘get it done and out now’ and hopefully people will sense your passion for it type of thing. But I would’ve made sure that my video was really high-quality and I would’ve cut it down by about 80%. We also would have put a lot more effort into gaining public support of the idea prior to launching to let people know that we were going to launch the Kickstarter. I think in the end run it would have been far more successful than it was because we did little to no crowd sourcing. I would also have met up with a graphic designer and come out with preliminary design so that I had something to show the public. That way people would have been a little bit more inspired to back it. It’s asking a lot of of the public to imagine how great the game is going to be or look if they’ve got nothing to go off of. 6. How many games do you plan to print after your 2nd successful Kickstarter? This will actually be our third printing once our second campaign ends. We sold out of our printing on our one year anniversary of going into business. During that year we had quickly become educated in the world of game making and had found a game company to produce a larger order, at a better margin for everyone involved. We had 5000 copies of Movie Buff made and we are actually poised to be sold out of all those copies by the end of 2016. Our new print run will be at least 25K copies (we are still finessing the details with the factory. So that number may actually increase before the order officially processes). 7. Who all made your Kickstarter campaign? And how long did it take to make? Our first campaign I did on my own, and it was ridiculous. Again because I came in with absolutely no knowledge of what I was doing. But, boy howdy, how 2 years can change you. This time around, our partners are the ones responsible for running this kickstarter. I gave them the pertinent details, and was available to be in the video, but they mostly took over all the day to day stuff for the kickstarter, and I would pop in with edits or glaring oversights. 8. What is your favorite part of game design? I would have to say the game mechanics is probably my favorite part of designing a game. Once you have your theme for the game you get to sit and explore how you want the game to work and that’s what makes the game uniquely yours. Now of course there are going to be games that have similar mechanics. I was just saying “How can I make this game work exactly the way I want it to?” The way I would like to play if it were a game I was buying, and not making. 9. Name several areas of game design that you don’t like. Or that you find annoying. One of the most tedious/annoying/hard things about design of the game, especially when it’s your game, is writing out the rules. Because you know how to play the game and you know how the game should be played. But how do you appropriately and concisely tell a new audience so that they will understand it, universally? It’s a constant editing and re-editing of your own words, which can become so convoluted because you’re trying to create directions with mass appeal. It’s a challenge creating directives that will allow anybody be able to pick it up and run with it, that it makes it super confusing. Be prepared for multiple edits/revisions of your directions. Take the feedback graciously and remove your emotions. The feedback is there to make it a better understood (hence, more enjoyed) game. In truth, I can’t stand the legal aspects of the game design/production. Endless hours of my life, I’ll never get back, have been put into securing and protecting the idea and design. The costs are insane and that can be infuriating. It takes a lot of the fun out of game design. It’s a necessary evil, but one I’d prefer to delegate and be able to focus on the creative. I am not at all artistically inclined. I wish I had the prowess and talent to do what our graphic designer has done (and he is incredible) and have it translated from my head into a product, but I don’t. And that’s annoying. Here are the specific questions Chris wanted to ask Justin about making and kickstarting a party game. 10. 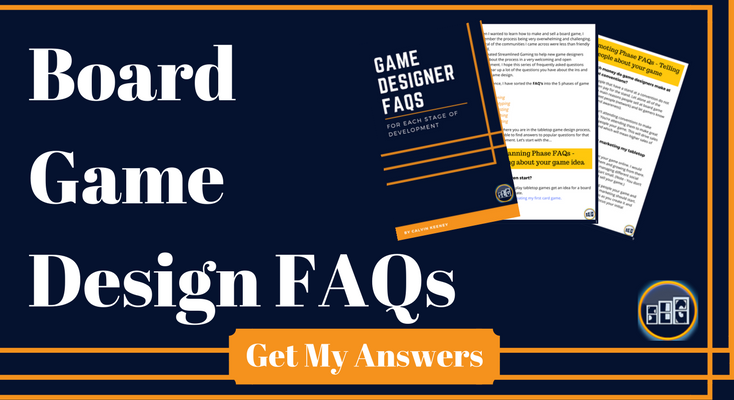 What are the differences in your approach between doing a Kickstarter for a project and a Kickstarter for a reprint of an existing game? It’s very interesting approaching a kickstarter campaign for an already existing product versus a kickstarter campaign for a product not yet out there. When we did our very first campaign for kickstarter, nothing existed for it other than the idea in my head. And so we had nothing to show. I had not connected with graphic designers or card companies or anything like that. I had no Prototypes to show. I literally only had my own passion and the idea in my brain. Which is why the video itself was very scarce and the cards I was using in the video where nothing like the end result. It wasn’t until we had raised the money to produce the game that we began to really be able to finance the idea with the graphic designer and secure a print house. Now the second kickstarter campaign we already have the game itself already finished. And of course we are looking at doing our bonus features which are still in the process of being designed, but we have the idea for the cards and what they’re going to represent as well as some fun little extra surprises. One of the most awesome things, I think, is because when we did the very first kickstarter we had nothing other than just wanting to get a game made. We had no concept for stretch goals or extra things to add if the crowdfunding was super successful, whereas with our second campaign, there was already a buzz about new cards that people would like to see in the game. So it is great that we were able to bring ideas from our fans and friends and make them reality in the game for the second campaign. 11. With all the party/trivia games out there, what are some of the things designers of those types of games can do to make them stand out? I think at the end of the day the one thing that a person making a party game can do, that makes the game stand out, is love that game so much. That’s the first step to making it stand out because when you love something so much it, in a little bit, stops being work or it stops being problematic. It just becomes this thing that you’re so passionate about. And that no matter what criticisms you receive that that passion for it keeps it going. This allows you to find new and amazing things to have for your game. For instance, I love movie trivia so much and one of the things I wanted to do when I was making Movie Buff is to make sure that the game itself had infinite replayability. So many of the trivia games that I grew up playing eventually either got old (because you keep seeing the same cards over and over again) or you memorize all the answers, which takes all the fun out of it. And it’s not a test of yourself, you’re just proving that you are capable of remembering something rote. 12. What do designers need to keep in mind while designing a party game? I think one of the most important things to remember, in my opinion, is that no matter what type of game you’re creating, be ok with the fact that the game is not going to be for everybody. Everyone is not going to like your game and you’re going to have to get over the negative criticism. Bottom line is that the game just doesn’t speak to their preference. And we’ve seen that happen with every single party game that’s out there. Some people don’t like trivia games, some people don’t like card games, some don’t like boardgames. With that, there should also be recognition that, when creating a party game, there should be a certain degree of mass appeal. Focus on a general type of idea that is easy enough to learn, in a short period amount of time, and not overtly confusing. It should stay fast-paced and fun and keep the party going. Nothing’s worse than opening up a big set of instructions and feeling like, oh my gosh I need an hour and a half to go through this game. That’s not fun. You want to be able to hit the ground running. Lastly, keep the design of the game small enough so that it’s easily portable. Thanks to Chris Amburn for suggesting this interview. It was nice to have Justin on and learn from what all he has gone through perfecting the world greatest movie trivia game. If you have someone you want to request that we interview, then please leave a comment below. I would be happy to include specific questions you have for the person as well just as Chris did for this interview. Good luck making your games! Want to Read More Interviews?